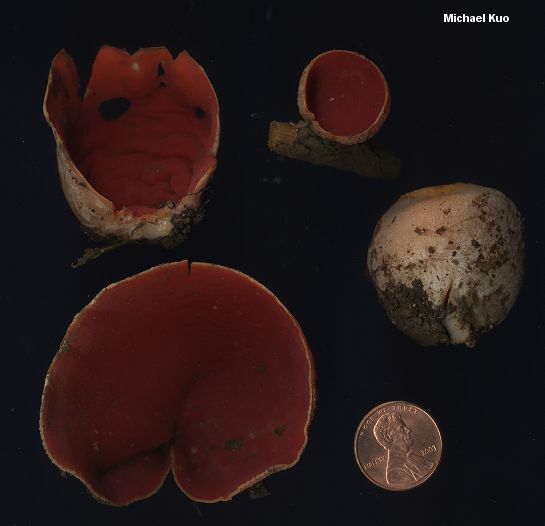 Morel hunters in eastern North America are familiar with this gorgeous, bright red cup fungus. 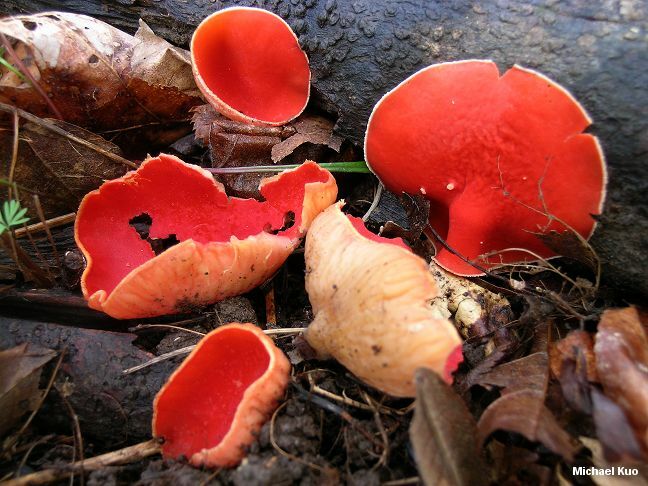 To the naked eye it is identical to Sarcoscypha dudleyi; both are bright red and cup- to saucer-shaped, and both feature a downy, whitish to pinkish underside. 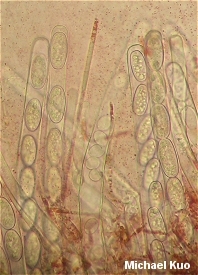 Under the microscope, however, Sarcoscypha austriaca features elaborately twisted and curved hairs on its undersurface, and spores that are not fully sheathed, lack large oil droplets, and often feature flattened ends. To my knowledge, contemporary DNA studies have not been published to support the idea that our North American version of Sarcoscypha austriaca is the same as the original, Austrian version of the species first described in the late nineteenth century. Ecology: Saprobic on decaying hardwood sticks and logs (but sometimes the wood is buried and the mushrooms appear terrestrial); spring; widely distributed east of the Rocky Mountains. 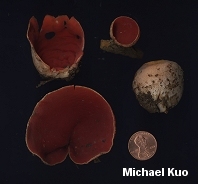 Fruiting Body: Cup-shaped to disc-shaped or irregular; 2 to 7 cm across; upper surface bright red, fading with age, bald, often becoming wrinkled with maturity (especially near the center); undersurface whitish to pinkish or orangish, downy; stem absent or rudimentary, colored like and continuous with the sterile surface; flesh thin, whitish; odor not distinctive. Chemical Reactions: KOH and iron salts negative on all surfaces. 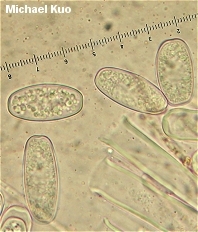 Microscopic Features: Spores 25-37 x 9.5-15 µ; ellipsoid to nearly football-shaped, with rounded or, not infrequently, flattened ends; typically with many small (< 3 µ) oil droplets; when fresh and viewed in a water mount sometimes appearing partially sheathed at the ends (with "polar caps"). Asci 8-spored. Paraphyses filiform; with orangish red contents. 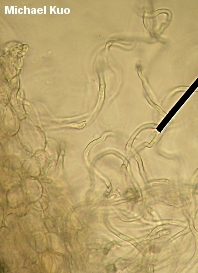 Excipular surface with abundant hairs that are elaborately curved, twisted, and intertwined. REFERENCES: (O. Beck ex Saccardo, 1889) Boudier, 1907. (Harrington, 1990; Baral, 2006.) Herb. Kuo 03171201, 03241201.